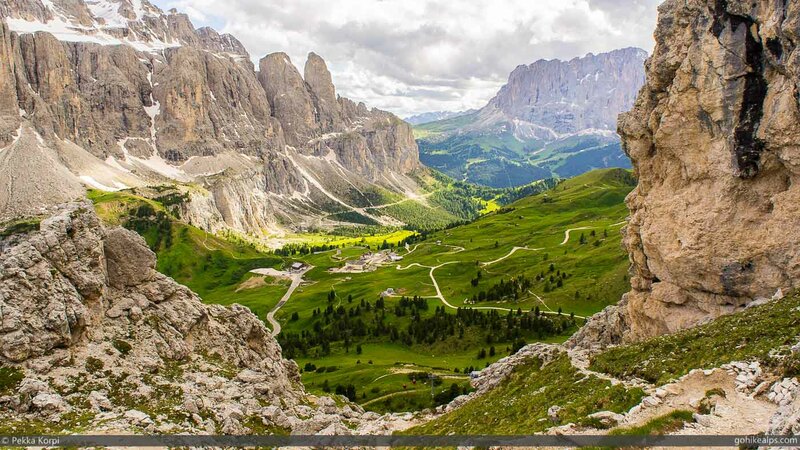 The Dolomites Alta Via 2 must easily be one of the most beautiful treks in the world. 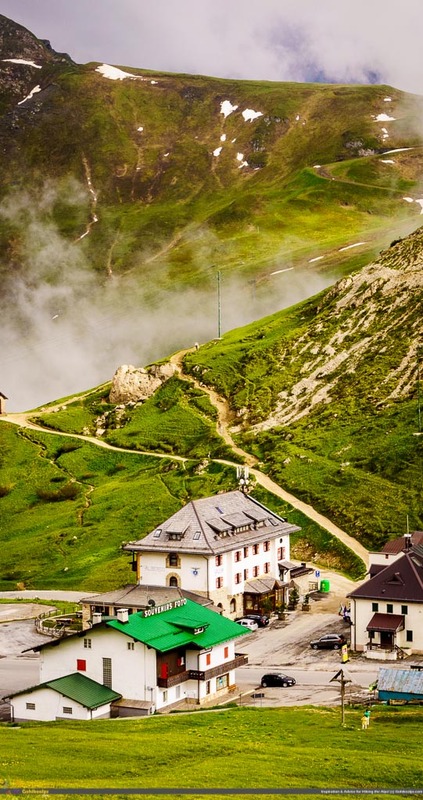 For any hiker seeking the best European experiences, this should be very high on your list. The Dolomites are a mountain range in North-Eastern Italy, designated as a UNESCO World Heritage site due to their rugged, natural beauty. The Dolomites really are a unique part of the world well worth visiting both in the summer and winter. In the summer it’s a paradise for hikers and climbers and in the winter it turns into a ski paradise. Alta Via 2 crosses a very popular, very large ski area – Dolomiti Superski, that’s spread around the Sella Massif and the valleys around it. 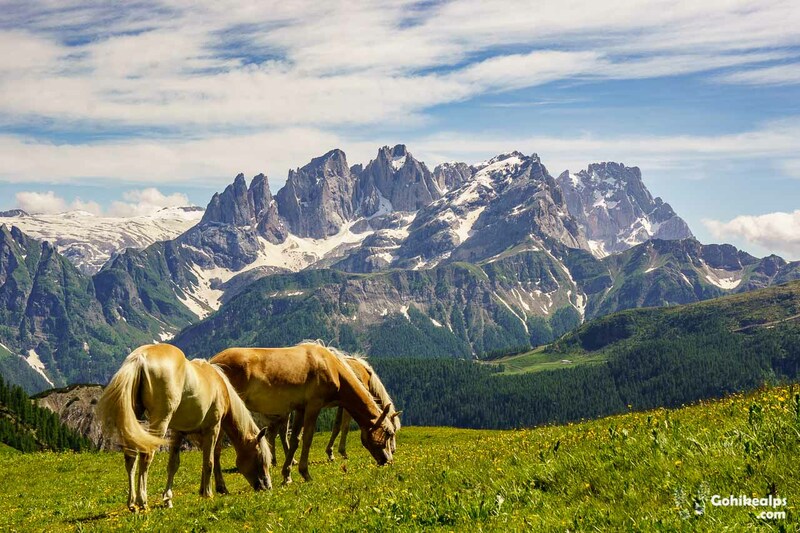 There are several Alta Via’s (or High Trails) that cross the Dolomites from North to South. They’re numbered 1-6. Unofficially there are probably more, I’ve seen references up to AV8. Alta Via 1 and Alta Via 2 are the most popular ones. Alta Via 1 seems to be easier and more crowded, whereas Alta Via 2 is more rugged and hence less walked. This planning guide gives you the facts you need to know to get on the Dolomites Alta Via 2. Please also take a look at my own personal experience walking 6 days on this trail from Brixen to Passo San Pellegrino – you’ll get a good feel for what it’s like on the trail! The AV2 starts in Brixen (Bressanone in Italian), which is on the A22 – the main corridor across the Alps in this region – and is easily reachable by train or car. Closest International Airports to Brixen are: Venice and Innsbruck (only intra-European connections). Munich is a little further away but I recommend considering it as your gateway. Read here why. Duration: 13 days is suggested. Can be done in less if you’re fit. When to go: During the summer. Snow can be found late in to the summer in some places. Read here about our snowy crossing of the Sella Group. Dolomites Alta Via 2 runs through across the beautiful part of the Dolomites. It is fairly long and demanding and, as such, should not be underestimated. However, it runs through populated areas so even though you will be alone in the mountains, you’re really not very far from civilization. The trek starts close to the border with Austria, with Austrian Tyrol on the other side. I was told that local like to refer to the starting point as Brixen, not Bressanone. This is natural since the local language is German. By the way, all the literature I can find suggests that this is normally walked from North to South. Not really sure why that is, but maybe the scenery ahead is more impressive this way! Brixen is a beautiful, historical city worth visiting by itself. It lies just south of the Brenner Pass, the main transport corridor into Austria and Germany beyond which makes it easily accessible from either north or south by car or rail. The best airports to fly in are be Munich, Innsbruck and Venice. The northern part of the trail from Brixen first climbs up on the Plose mountain. There’s a ski area so you don’t quite get the feeling of solitude but it is, nevertheless very beautiful and from the top you have beautiful views in all directions. If you start in Brixen, I recommend booking accommodation in advance. Soon enough you will enter the magnificent Puez Odle Natural Park. 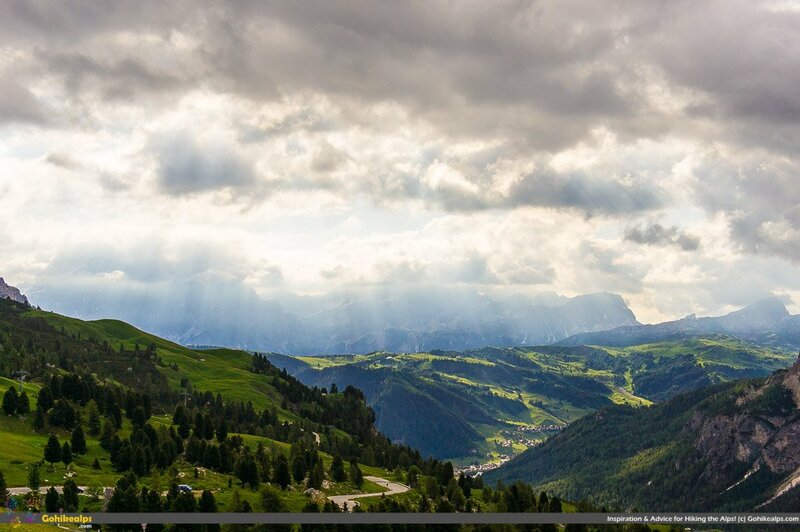 You’ll get wonderful views down the Badia valley. After crossing Puez Odle, you will cross Passo Gardena and the northern part of the Sella Ronda ski circuit. Passo Gardena is served by public transportation and there’s hotels so it would be an option to start or end your trip. We stayed and Hotel Cir and found it to be nice. After Passo Gardena you cross the magnificent Sella Massif to emerge to Passo Pordoi on the other side. 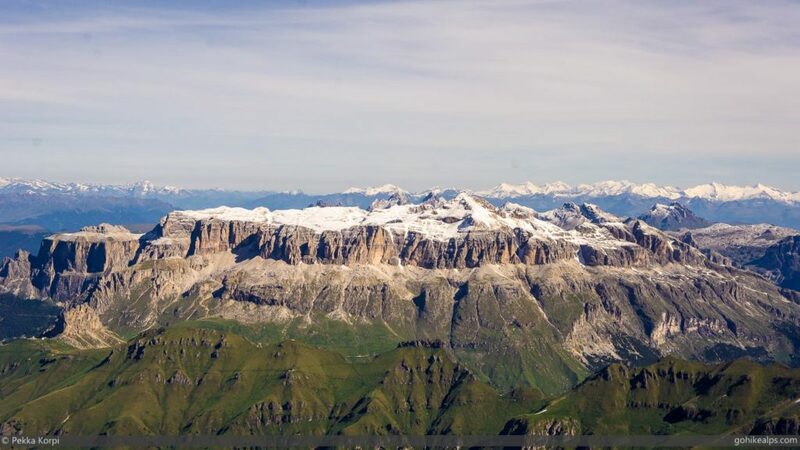 From the Sella, in good weather you’ll get your first glimpses of the Marmolada – the Queen of the Dolomites! Passo Pordoi is another option to begin or end with hotels and public transportation. From Passo Pordoi you will continue on the Viel del Pan, an ancient route that links Passo Pordoi to Passo Fedeia, used historically for transferring flour by the merchants of Belluno. All the while on the Viel del Pan, the might Marmolada keeps you company. From Passo Fedeia you descend to Malga Ciapela, a small ski resort town with some hotels. Alta Via 2 now takes you around the Marmolada from the eastern side and then behind it in the South, to Passo San Pellegrino, where again are some hotels, a small ski area and a bus stop. You can check out the hotels in Malga Ciapela here. Here’s accommodation in Passo San Pellegrino. Descending to Passo San Pellegrino, you’re awarded with beautiful vistas into the exceptional Pale di San Martino, which Alta Via 2 crosses next. 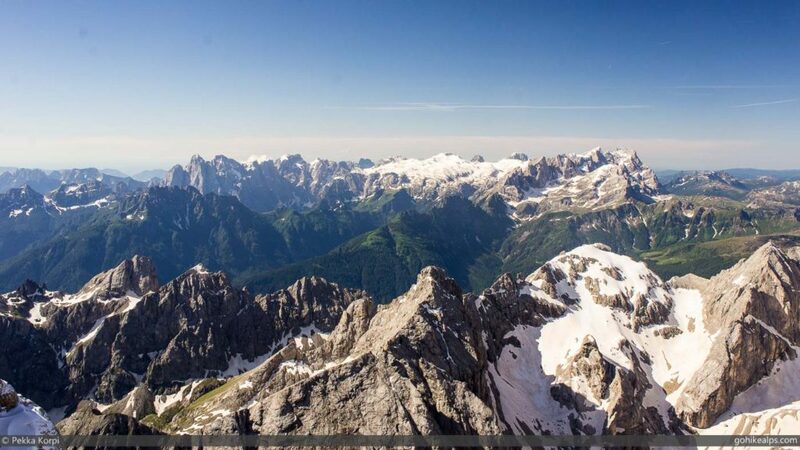 Pale di San Martino is the southernmost of the big Dolomites groups, at the borders of the Trento and Belluno provinces. It will take you a few days on rugged terrain to cross this range before you arrive at your final stages. The final days of the AV2 will be spent crossing the Vette Feltrine, the last mountains of the Dolomites before the Veneto plains. Being the first obstacle for the warm air that rises from the South and the Mediterranean, this stretch is often covered in mist, and the local flora is quite impressive as you gradually descend towards sea level. The final stage takes you to Croce d’Aune, a short way from the walled renaissance town of Feltre. From there it is easy to get where ever you may want to go by public transport. If you don’t have the time or will to walk the entire length, there’s several places to get on and off along the way. If you want to spend some nights in hotels instead of mountain huts – that is, private rooms and long, hot showers – there’s options for that, too, along the way in some places. To adjust, you just need to plan accordingly. Please read through our 6 day Alta Via 2 experience. We split our trek differently from what the typical suggestion is and spent several nights in hotels. You’ll miss out on some beautiful sunsets and sunrises, and the encompassing mountain hut atmosphere but you gain uninterrupted sleep and, well, the hot showers. Organizing your transport depends on you. If you’re planning on doing this entire walk, I recommend using public transportation. If you drive to Brixen, you’ll need to park your car somewhere (and pay for that, practically) and then go back to get it. Make sure you understand how much time these connections will take. For example, last time I checked Passo San Pellegrino was far away measured in hours to get there. Basically, same story as above but in reverse. Get to one of the places where you can take a bus. It could be one of the passes, or it could be a town off the AV2. For example, we hiked to Moena – west of Passo San Pellegrino – and got a bus from there. From Feltre you can hop on a train and get to Venice. Or, you can hop on a bus and get to, for example Trento and then hop on a train from there. If you left your car in Brixen or flew in via Innsbruck or Munich, riding a bus to Trento and getting on a train there is probably the best choice. If you flew into Venice, the train is obvious. Sure! Venice is worth a visit if you have some time to spare! You’re in the neighborhood We visited before our trek and it was worth it. To be honest, though, after fully packed and overly crowded Venice, getting to the mountains was a real relief. 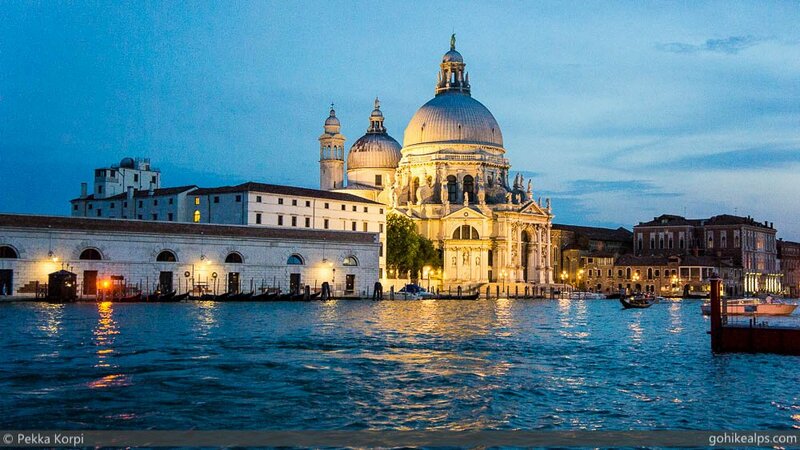 Check out some hotel deals for Venice here. I recommend also checking out the hotels in Mestre, on the mainland just next to Venice. It’s cheaper but still convenient. Of course, not as wonderful as Venice proper, but especially if you’re on a budget, I’d check it out. Now let’s get back from thinking about Venice, to the Dolomites Alta Via 2 itinerary! Here’s how to do it. The following day stages have you sleeping in mountain huts, which is great! I really recommend you do because it’s the authentic experience and there’s really nothing quite comparable to a beautiful sunset, and a beautiful sunrise on the mountain. However, to spend some nights in hotels, see how we did it for the first 6 days to get an alternative approach. This is a long trek, don’t underestimate it. You can squeeze in longer days but I advise to build in some slack. As always, weather can be tricky. 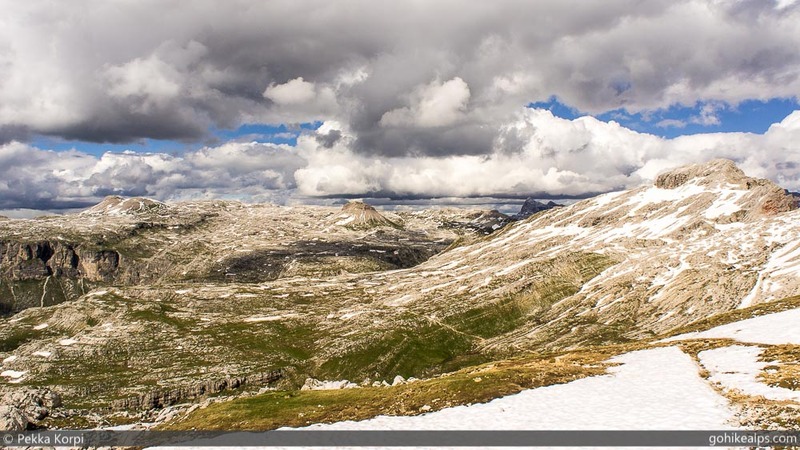 Read about our snowy experience on the Sella Massif in July here. There’s not many places to get supplies along the way. If you stay on the route, after Brixen the first shops are in Malga Ciapela. That’s on the 6th day according to the schedule, unless you make a detour to, for example, Selva Val Gardena near Passo Gardena. To get off the trail elsewhere, you will need to walk somewhere. I strongly recommend reserving your nights at the mountain huts beforehand. It can get very crowded at times. Even though you probably won’t be left out in the cold, sleeping in emergency shelters or on a filthy mattress somewhere is not necessarily very enjoyable! Mentally at the Dolomites already? Me, too! Just waiting for my next trip there! If this information is useful to you, please sign up for Gohikealps Inspiration & Advice now and download our exclusive One Page Printable Gear Checklist - designed specifically for the Alps! It's guaranteed to save you a headache when it's time to pack! You need maps. I recommend getting them beforehand. Don’t go, if you don’t have them! If you don’t get them beforehand, get them at Brixen. You can’t expect to be able to find them on the trail. Make sure you have the necessary gear for a Multi-Day Alpine hike. Check out the Gohikealps Packing Guide, sign up and download our printable checklist for reference. I also highly recommend getting a book. I used Gillian Price’s excellent “Trekking in the Dolomites: Alta Via 1 and Alta Via 2 with Alta Via outes 3-6 in Outline” to plan our trip and ended up taking it with me for reference. Very helpful. Being as popular as they are, there’s all kinds of information available on the Dolomites all over the Internet. Just google up Dolomites Alta Via 2. First of all, mine: On this site you’ll find a 6 day, non conventional, hotel preferenced story of Walking Dolomites Alta Via 2. If you book from them, say “Hello!” from Gohikealps! By the way, I’ve found that often these huts are easier to reach by phone rather than email. This is especially true during the summer when they’re all busy catering to guests. We stayed at Hotel Cir and liked it! Hotel Savoia – we ilked, I recommend. We stayed at Hotel Tyrolia and found it to be comfortable and good value. There’s a few others too you can find through the link. Rifugio Capallo Passo Valdes is on Booking.com. If you’re in doubt, I say GO! The Dolomites Alta Via 2 is unique in so many ways that it is worth it to go. If you’re flying from overseas it’s far away but you can easily combine this once in a lifetime trek with other great things – such as Venice, and other wonders that Northern Italy has to offer. Lake Garda is nearby, as is Milan. Or if you want to experience Austria and Germany, just hop on a train. I started this site to give ideas to hikers and trekkers who may not yet be familiar with the Alps. When friends or acquaintances ask me what is the best and most beautiful place to go to, I always respond: The Dolomites. The Dolomites Alta Via 2 is the best of it. NextSt. Anton am Arlberg – Basecamp for Vorarlberg Hiking! Great reference and route descriptions! Thanks! My wife and I will be trekking on the Alta Via 2 this summer from July 10-15, before heading south to visit Venice, Florence, and Puglia. We’ll be staying our first night in Bressanone and most likely taking the cable car up the first hut area, and hiking to Rifugio Genova for our first night on the actual Alta Via 2. We have already made reservations for all rifugi, except Rifugio Pesciadu, which does not seem to respond to our emails (any suggestions?). One question for us is, since we are flying into Munich and then heading south after our trek, are there any baggage “carry forward” services that could take our extra luggage from Bressanone to Paso San Pellegrino? This is a typical kind of service for instance, on the West Highland Way in Scotland and around the Tour de Mt. Blanc, but we have not been able to find anything like that for the Dolomites. Other than that, we love your packing guide; it corresponds with much that we have learned in other treks and lots of serious backcountry backpacking over the years. We’ll keep checking out your site and thanks for helping us all out! Thanks, John and Jessica. Good questions. I never looked into a carry forward service but now that you mention it, I’d be surprised if it wasn’t available somehow. Have you tried calling the tourist office in Bressanone or maybe try this http://www.suedtirol.info/en/_inc/contact ? They should probably know how to arrange this, or at least where to ask. If you’re getting off at Passo San Pellegrino, you will probably go down the valley through Moena. It’s a sizable town. I think you could literally mail you things to one of the hotels there, or maybe the bus company could handle it. You’ll be in the mountains for several days so there’s plenty of time for your things to get there. As for Rif Pisciadu… I would probably try the tourist office at Colfosco or Selva Val Gardena for that one. They should know how to get in touch. For all of these things, I’ve found the tourist offices to generally be helpful. I hope this gives you some ideas. Let me know if you think I can help with anything else! Sounds like you have a wonderful trip coming up. One other question: does the main Alta Via 2 have sections that require a stretch of sling rope and a couple of carabiners for safety or are those via ferrata alternate routes or side routes only? You can avoid all Via Ferratas on the main route, they’re all on the side. I only walked to Passo San Pellegrino so 100% sure between Bressanone and there. Hope you can help. Sorry to use this thread for a question on AV 1. Are there any trekking routes (full or partial) from the end of the Alta Via 1/Belluno to Innsbruck? I have 4-5 nights to reach Innsbruck from Belluno. Would like to trek as much as possible rather than taking trains/buses. Thank you. I think walking from Belluno to Innsbruck in 5 nights is not possible. It’s just too far. Have you thought about this: after AV1 take a bus to Feltre (it’s very close) and start walking AV2 northbound? You could then make your way to, for example, Bolzano and then take a train from there to Innsbruck. If you plan this, I would plan carefully for where to get off on AV2 and catch a bus. Depends on you condition and willingness to walk long stretches, of course. What do you think? Thank you Pekka. I will have already completed the AV2, so, if possible, I don’t want to repeat any segments. From Belluno, I was hoping to catch a bus to some point/town north and then trek towards Innsbruck along a non-AV1 or 2 route. I would then take a bus/train to Innsbruck if the route didn’t finish in that city. I don’t know much about the border treks in that region. Sorry for the late reply… How about this: take a bus to Brunico and get on the Via Alpina red trail from near there. That will take you over the border to Austria and near Innsbruck, too, if you have enough time. Or you can get off at Mayrhofen and get a train to Innsbruck. Check out via-alpina.org and the red trail from there. The site has very detailed info to help you plan. What do you think? What would be your advice about hiking the alta via 2 with longer days? We are avid hikers from Alaska. We’d like to cover the entire route but are wondering what would be the best way to condense 13 days down to 8 or 10? Sorry for the very late reply! There’s definitely room for squeezing some time if you’re experienced, but some of the stretches really are quite long without chances for spending the night. I mention the book on this page since it has more detail on the different stages and I found it to be very helpful in planning. I’m hesitant in recommending how exactly to do this but I will recommend getting the maps beforehand and planning properly with them. I would also recommend building in some slack for bad weather and such. This really is a demanding route. Walking it all in 8 days, I think, would be beyond me. 10 days, for me, would be realistic. Sorry again for the late reply and apologies for the somewhat vague answer. Happy to hear – I hope you have a great time! Hi, thanks for the amazing information. I have a quick question, do you think it is possible to do the Alta Via 2 alone? I have some experience trekking or hiking in the himalayas but have 0 experience rock climbing. I don’t need to do the whole Alta Via 2 perhaps just sections of it as I have only 6 days anyway. What sections would you reccommend? Thanks!! Yes, it’s definitely possible to do this alone but I would recommend you are sure about your ability. There’s no need for rock climbing on the route, but it is demanding at times. In 6 days you can do what’s posted on this site, but I recommend getting the book for planning (link on this page) since it has more detail than this post and contains a different “rhythm” than what I did. From my experience, I would cut off the first day. I really liked the north part but am looking forward to doing the Pale di San Martino stage I missed due to not having bought a map beforehand. If you’re tight on time, pay attention to the schedules of public transportation. I hope you enjoy it! Thank you so much for responding. I will get the book. What do you mean by demanding – steep climbs and descents or narrow paths where I could fall off! I’m 34 and a woman from India and I think I am reasonably fit but not especially. I will definitely choose a slower rhythm but as long as it is not outright dangerous (glaciers, vertical rock faces, and narrow edges) I feel I could handle it. Also would there be other people on the path or is it possible to go an entire day and not see anyone? Thanks again! Hi Pekka, thanks for this info, it’s so complete and useful! I’m an avid hiker/camper/trekker, and was wondering if you thought this trail was possible to do with camping rather than staying in huts? Do you have any idea if there are campsites, or what the legal implications are on the trail? I don’t think camping is a viable option. There’s no camping areas on the trail, at least not on regular intervals. It would also be difficult with extra water & supplies, it’s tough enough as it is. I’m not sure if there’s a rule or law against it, but I would imagine there is. To sum it up: I would stick to huts & hotels. Hi Pekka, Good blog, I know from experience that it takes a lot of work. I have added a link on the following pages of my site to your planning info. I provide more general trekking data and videos, plus I cover the entire planet. I carried a tent and my own food and cooking stuff. It did give me the option to change my pace and do side trips. It also lowered the cost. I stayed in my tent half the time. However, it also made it much harder. Carrying 15kg is no fun and made some of the high altitude skinny trails, scrambles and ferrata much more difficult. As for places to camp? I had no problem finding spots generally. Naturally this only applies to green spots on high meadows or in valleys, not on the dry top stretches. Thanks for the insight – very valuable. I fully agree, the extra weight doesn’t help and personally I’m not sure I’d be up to carrying tent & gear on this trip but happy to hear its doable! Just curious – did you have trouble finding enough water or did you carry more than usual? Not camping I didn’t really pay attention to this. Thanks for sharing your experiance. I am planning to do (a part of) the trip end of july or begin august. I have 7 days to hike/ doing via ferrata’s. I always hike with all my food and tent to keep the cost low. But I don’t have much via ferrata experience and don’t know it is fysical to do with a bagpack that weight +/- 15 kg. I like to combine the hike with (as much as possible) via ferrata on the route. Do you think that is possible heavy backpackt? Hi Neel – sorry for the delayed response. I think it entirely depends on the difficulty of the particular via ferrata. Easier ones, no problem but of course the more physical it gets with the added weight. Tougher ones, I don’t think so. The tougher ones I wouldn’t take the heavy back pack. As always, I think it depends on your skill and fitness and if, or not, you plan on continuing from where the via ferrata ends or go back down. Make sure you have via ferrata gear with you, that’ll add some weight to your pack, too.